A look back at a bygone era, when the drinking of tea involved ceremony and respect for the plant. Colin Conor recalls his life as a trainee tea buyer in London and offers an almost foolproof method for brewing the perfect cup of tea. A subliminal lift of spirit comes from the drinking of tea extracted from the young leaves of Camellia sinensis. In former days, this characteristic was recognised by the Chinese aristocracy, who guarded the secret of the tea plant even with the threat of death. Thus, naturally, tea products traded to the West – for those who could afford them – were highly appreciated. 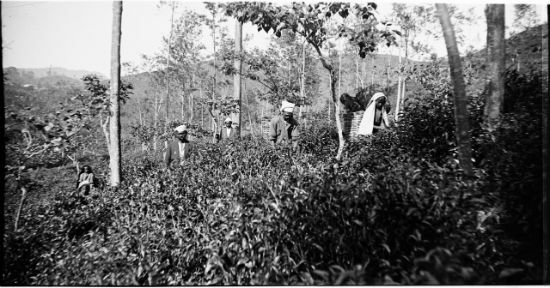 History shows that the secret became undone, leading to the great tea-growing enterprises of the British and other empires. For a century or so, quality and its appreciation was maintained, but, where once the making and drinking of tea involved ceremony and respect for the plant, today marketing for the masses of the Western world, together with convenience, has near destroyed the appreciation of quality and variety – that insipid leveller, the teabag, rules. Therefore the following words are for those folks who appreciate their tea, and in the forlorn hope for quality leaf in the pot gaining precedence over the dread bag. Camellia sinensis is native to the slopes of the eastern Himalayas, and, although it is but a simple single species, like the grape Vitis vinifera, it provides the potential for a multiplicity of flavours. Subtle flavours derive from individual plants, different soils, different altitudes, different climates, different countries, different techniques of manufacture, different ways of making the brew, and finally the sensation registered by the individual palate. Here is a quick look at how black tea comes into being. Firstly it has to be grown just right, with the necessary care, and in the correct climate. As a generality, tropical highland environments with the occasional touch of frost promote flavour, lower altitude and hotter conditions provide stronger brews. Camellia sinensis has the ability to grow to the size of a small tree, a condition that is encouraged where seed is to be collected. However for the production of the drink, the height of each bush is maintained at about waist level by the combination of pruning and plucking. The latter ideally being carried out manually by tea pluckers (women) who expertly and swiftly select new, pale green translucent growth comprising the bud and topmost leaf (sometimes more leaf is taken but this degrades the product, i.e. significantly more quantity and less quality). 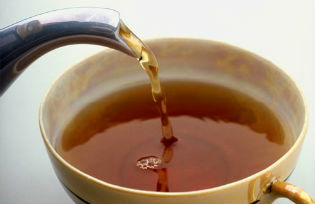 A good tea is recognised by its bud content, this being described by the words – golden or orange. Beware of similar brown bits masquerading as bud, these may be fragments of twig (i.e. wood), indicating the taking of older, lower quality parts of the plant. 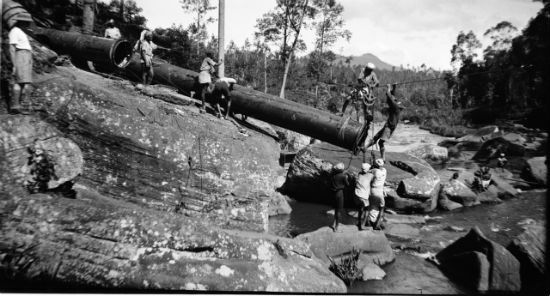 Mechanical harvesting or the use of shears is bound to include ‘wood’. 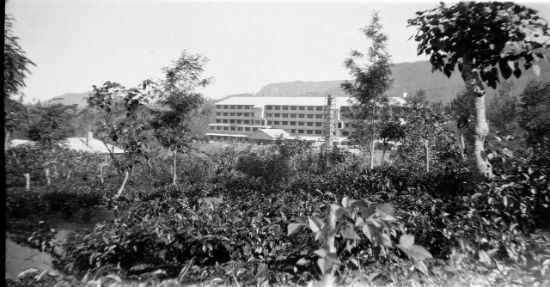 ‘Ceylon’ c. 1930. Tea pluckers and overseers. Camellia sinensis, imported from northeastern India, the shade trees being Grevillia and others from Australia. From the plucker’s basket the leaf is taken to the factory, and (prior to mechanisation) is spread across large areas of porous cloth shelving (tats) where it is beaten and bruised to break up the internal structure and release the juices to commence fermentation. After a time it is put through millwheel-like rollers and then piled into a special room to continue to ferment. This stage completed, fermentation is fixed by roasting, which causes the green leaf to turn dark brown to black. Finally, exiting from the oven, the leaf is run over sieves to grade the product into different size classes. These classes are pekoe (ideally a rolled-up whole leaf that uncurls when later brewed), broken pekoe (large pieces of leaf), fannings (small pieces of leaf a millimetre or two in size, or slightly less), finally dust. The general rule is that the bigger the leaf the better the flavour but weaker the tea, the smaller the leaf the stronger the brew but with less of the subtleties of flavour. Teabags are filled with small fannings, even dust in the worst cases. Referring to the above, the highest quality teas are called golden or orange pekoe, or broken orange pekoe (BOP). Wellington’s profile) in the far distance. Getting the chimney to site. The factory – near completion. 7. Serve the tea into cups, preferably pre-warmed. Do all the above and you are guaranteed a good and proper cup of tea (milk is optional). The quality of water really counts, nice clean rain water ideally will give a lovely orange infusion, the same leaf brewed in certain other treated waters turns a sickly grey, and strongly chlorinated water is simply frightful (although rumour has it that the British army once added the chemically-related potassium bromide in order to reduce sexual tension of troops constrained to barracks, on the other hand this rumour might relate to the taste of over-stewed army tea). Professional tea tasters, i.e. buyers and blenders, can clearly tell if the brews from sample teas have been made with either over- or under-boiled water. Either way, the tea maker is sent back with a flea in his or her ear to re-make the batch. Visually it is very easy to tell when the conditions are correct, because the leaf forms a frothy cap at the water surface. Unfortunately it is very difficult to emulate this in the standard kitchen, with the standard electric kettle. However it is possible to do so over an open fire, where the leaf is thrown into the billy as the water comes to the boil. The traditional Australian bush habit is to whirl the billy at arms length around a horizontal axis. This uncouth, but exciting procedure, apart from being a Health and Safety threat, is the wrong thing to do, because the 3-6 minute quiet infusion time allows each individual particle of leaf to saturate, so that on sinking slowly to the bottom, its flavours are given forth into the infusion. 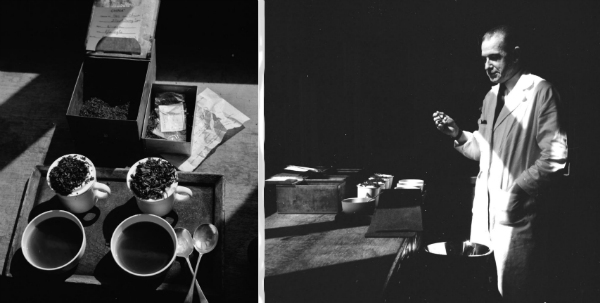 From the author’s experience, the tea taster has an assistant (the author 50 years ago) whose job it is to make tea, learn, and keep the spittoon proximal. For those not informed, spittoons are hollow cylinders on wheels, measuring about three feet high, and with a diameter of perhaps one foot. The top is an inverted cone with a central drainage hole. All is well, provided the trajectory of the ejected sample is at such an angle for it to be directed down the hole. The danger (for the assistant) comes when the ejection becomes closer to the horizontal and so is deflected upwards and outwards. Naturally maintaining the correct angle is the responsibility of the assistant, who is potentially in line of the ricochet. After years of practise that have caused many thousands of spits to expertly enter the spittoon, the velocity of the liquid, when ejected, can be quite considerable. In fact it is quite surprising that the London Games missed out on there being an indoor ‘tea spitting’ event. Without doubt this would have had a large following especially amongst the English. In the tea trade the equipment for making the brew from each tea sample is a cup with a serrated edge opposite the handle, a lid that fits the cup, and a bowl that fits both cup and lid when they are on their sides and horizontal. A small beam-balance is used to weigh the correct amount of tea which is placed into the cup. The lid is used to cover the cup after boiling water has been added, and a stop clock set for six minutes. On the buzzer sounding, each cup, with its lid in place, is tilted to rest horizontally within its bowl so that the infusion drains into the bowl. Once draining is complete, the tea leaf is flicked from the cup onto the inverted lid, which is placed upon the cup, which is then placed behind the bowl. The colour and composition of the leaf provides important information to the taster, as of course does the colour, ‘nose’, and taste of the infusion. Naturally every sample is not made separately, each ‘kettle’ making perhaps 20 teas before it goes off the boil, maybe one fifth maybe of a particular session. copper kettle. Note the lids covering the filled cups. leaf in the middle, and bowls of infusion at the front, which generally are kept insulated by strips of baize prior to tasting. Right: the blender sampling tea, the baize strip folded on the table, and the spittoon ready in the foreground. Another thing about tea, unlike wine, is that its quality starts to reduce immediately after manufacture. Presumably this has something to do with contact with the atmosphere. To preserve quality, tea chests are well-lined, or smaller parcels of tea are wrapped in heavy foil. Nowadays enlightened tea makers will vacuum-pack tea for freshness. This is another disadvantage for the tea bag, which presents a small flat, large-surfaced area open to the air. One duty of the trainee tea buyer or blender was to send free packets of tea to complainants. Generally these complaints related to items other than tea leaf contained in the occasional packet. Most commonly these items are small pieces of wood derived from construction of the tea chests, but mummified small mammals, and insects are not uncommon (usefully, the author presented a hitherto unknown species of cockroach to the Natural History Museum in London for description and naming), and there was the infamous case of a tea planter missing his raincoat, at least that was before it was unpacked in London – revenge of a slighted factory worker! As was pointed out earlier, obtaining good leaf can be the most difficult part. Naturally there are many ways of making a brew, with the appreciation of it largely relying on the national customs of the consumer. A brew of scrapings from a compressed brick of tea combined with fermented milk is the way of certain central Asian nomads, while in central Australia some once-were-nomads put a few grains of leaf into a cup of hot water, drinking the result without straining off the leaf. Both the Asians and Australians are quite happy with what they are used to. To the British, however, there is the perfect cup of tea, but also the good cup, the average cup, the not very good cup, and the truly awful (the latter developed to perfection by the former British Rail). 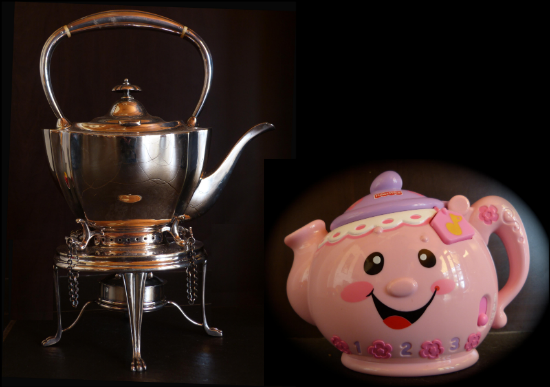 The traditional way of making a perfect cup of tea is an art, which, as described above, certainly involves method. One of the reasons for compiling this article, has been to explain a method of how to work towards the perfect cup from black-leafed Indian or Ceylon type tea. Unfortunately, the human world is not a perfect place, and the following tells why the making of the perfect cup does not rely simply upon the craft of the brewer, but also is strongly influenced by pre-existing factors such as the quality of the leaf – a appropriate cliché here being that it is not possible to make a decent purse from a sow’s ear. This is the spiritual bit: the degradation of the appreciation of tea has been effected in but 50 years, which in human terms, is the equivalent of two generations, ample time for wisdom to dissipate. The levelling effect of democracy is partly to blame, but commercial forcing away from a discerning market to a mass one bears a greater responsibility. Shops, i.e. stores and supermarkets, control what goes on shelves, and the public buys from what is available on the shelves. The shelf population has undergone a sly quality subsidence from 50% leaf tea, including some of quality, to 50% ordinary leaf tea and teabags, to teabags completely dominating with a few boxes of ordinary leaf tea somewhere near the bottom shelf. Lack of popularity is often given as the reason, i.e. fewer people buy quality tea than the cheaper ordinary stuff. In order to fill those mass-market shelves, the aim of tea companies have been redirected by market pressure, away from the lower volume production of quality tea, towards the higher production rate for quantity. One hundred-year-old quality plants bred from seed (hence allowing genetic variability and a variety of flavour), have given way to cloned high production versions grown from cuttings – quality rarely follows quantity! It is for sure that older blenders, who had supported the initiation of the teabag half a century ago, will have turned in their graves in the knowledge of the insurgence and dominance of the ‘TB’. There would have been no comprehension that quality would have become displaced by quantity. Just imagine the outcry that would ensue if, overnight, wine was available only as cask-standard stuff in wine glass-sized plastic sachets, but with varieties labelled as for example: Persian Supper, French Dejeuner, German Dessert, or as a comparator with Earl Grey, Pre-Mulled Special. Without doubt there would be a fair-sized revolution aimed at a return to former times; the international ‘shock jocks’ would see to that. Yet this is exactly what has happened to tea in the western world, albeit over a generation or two. Returning to tea, a sort of revival has taken place with the introduction into some western cities of the occasional ‘tea café’. These places (the few the author has experienced) certainly supply varieties like Darjeeling, Assam, Ceylon, Oolong etc., but that is not enough for within each of these there is a spectrum of taste. In another world it would be quite possible for a street of tea houses each specialising for the discerning palate in Darjeeling, Assam, Nilgiri, Ceylon, and the multitude of Chinese and Japanese leaves. Worse still for the tea purist, the modern ‘tea cafes’ sell a plethora of stuff composted with other plant matter, e.g. oil of bergamot, jasmine, rose petals, cloves, these additives do little more than mask the flavour of the host leaf, which as a result need not be of quality (the addition of lemon to ordinary tea is an old ruse to emulate some of the best, and therefore most expensive, Ceylon teas, some of which do have a distinct lemony flavour). Such crude bastardisation of the subtle flavours of tea is extremely regrettable, and it is even more regrettable that so many of the customers have come to believe that what they are paying good money for, they presume to represent quality. However … ‘Forgive them for they know not what they do’! How can folks, who have never been shown the variety of taste, learn to appreciate the subtleties of quality tea? It is a great shame of this new world that, not only has the industry and care of generations of Chinese perfectionists and dedicated British and Australian tea planters been ground down to the mediocre level of the abhorrent little tea bag, but also that society should be unaware of being duped into slipping further towards mediocrity. C.H.H. 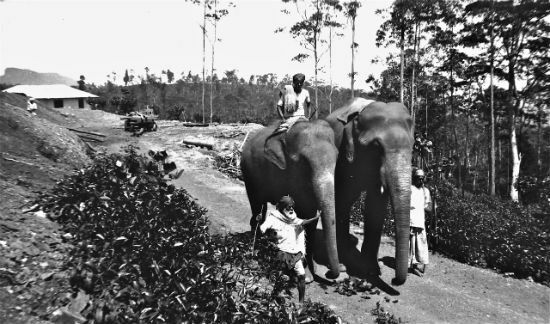 Conor, the author, was brought up in Ceylon (Sri Lanka), and following a father’s and grandfather’s footsteps commenced work in the tea industry in 1960. Politics intervened, and he is now a geologist, and, as such, has drunk much tea in a variety of environmental conditions. Photographs included with the text are from either the 1930s or early 1960s, and (disclaimer) apart from the drinking of tea, the author’s knowledge comes from those times.